Tesla spent $US1 billion in the third quarter. General Motors also spent $US1 billion in the quarter. As a new carmaker, Tesla could make more off the cash it is spending than a legacy carmaker, but for now, its cash burn is a challenge. Tesla had a horrible third quarter, posting the worst loss in its history as a public company. Of course, nobody expected a good quarter, and in October the carmaker’s stock had already slid significantly from its 2017 peak of almost $US400 a share. 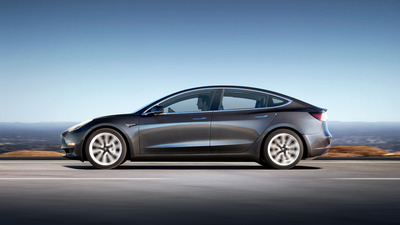 Over the next few days, everyone will ponder Tesla’s results and deal with the fact that mass-production of its new Model 3, slated to hit 20,000 vehicles per month by December, now won’t touch that level until maybe March of next year. Tesla is spending mightily to launch the Model 3 and ramp up battery production at its massive Gigafactory in Nevada. In the third quarter, it burned $US1.1 billion, according to an investor letter published Wednesday. That spending is characteristic of what Tesla is up against as it develops a new line of business as a mass-market automaker, versus a luxury car company. In many ways, it’s starting from scratch. By contrast, a carmaker that isn’t starting from scratch — General Motors — also spent about $US1 billion in the third quarter to sell a portfolio of over 40 vehicles in the US and many more worldwide. Spending that $US1 billion brought in over $US33 billion in revenue. Tesla isn’t operating anywhere near that level, and if you take out the Model 3 ramp and all the problems with it — which have to be costing money — the cash burn to run Tesla’s established business of luxury vehicles could be sustainable. The company’s revenue, which is derived mainly from sales of its Model S and Model X, came in for the third-quarter at close to $US3 billion. That adds up to a company that’s banking about ten times fewer billions quarterly than GM, but that’s also spending the same amount to put many fewer cars into the market. This suggests that if Tesla can survive the Model 3 challenges, it could operate much more efficiently than a big, traditional automaker and reward investors accordingly. But it does need to figure out how to get the Model 3 to a level of production where it can satisfy demands, which is high — Tesla has over 400,000 pre-orders for the vehicle, and it absolutely has to build all those cars to make its current business work.